Easily grown in shallow, rocky, limestone to sandstone, dry to medium moisture, well-drained soils of moderate to low fertility in full sun. Good tolerance for light shade. Seldom needs watering, but tolerates moist (not wet) soils with good drainage. Plants freely self-seed in optimal growing conditions. Tolerates hot, dry sites and poor soils, and will spread fast in the garden. Also tolerates occasional foot traffic. Break off a stem segment and stick it in the ground for creation of a new plant. In the alternative, seeds may be started indoors 6-8 weeks before last spring frost date. USDA Zones 3-8. Sedum acre, commonly called common stonecrop or gold moss stonecrop, is a tiny, rhizomatous, tuberous-rooted, carpet-forming, evergreen succulent perennial which typically grows to only 3” tall but spreads in a moss-like fashion along the ground to 24” or more to form an interesting and often impressive ground cover. It is native to Europe, Northern Africa and Western Asia where it is primarily found in rock crevices, ravine edges and scrubby areas. 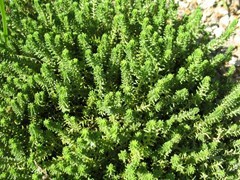 Plants are thickly clothed with blunt, conical, pale green leaves (each to only 1/4” long). Leaves overlap in shingle-like fashion. Small, terminal clusters of tiny, star-shaped, five-petaled, yellow flowers (each to 1/2” across) bloom in flat terminal inflorescences just above the foliage throughout most of the summer. Specific epithet is named for its acrid taste. Excellent ground cover. Possible lawn substitute with minimal foot traffic. Sunny border fronts or rock gardens. Atop rock walls. Walkways. Ground cover for hot sites with poor soils. Best massed or in groups. Site in areas where both the foliage and flowers may be appreciated. Containers.